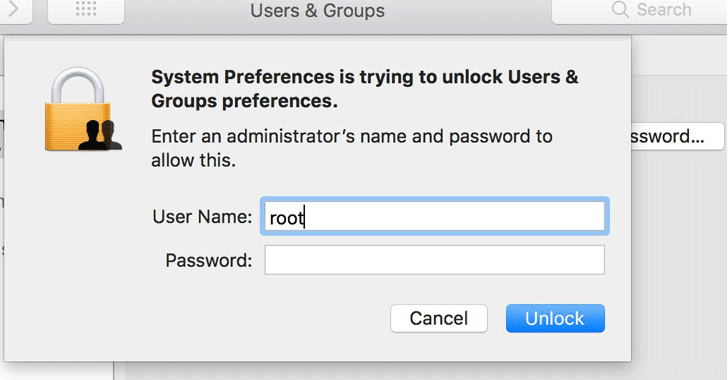 Discovered by developer Lemi Orhan Ergin on Tuesday, the vulnerability only requires anyone with physical access to the target macOS machine to enter “root” into the username field, leave the password blank, and hit the Enter a few times—and Voila! In simple words, the flaw allows an unauthorized user that gets physical access on a target computer to immediately gain the highest level of access to the computer, known as “root,” without actually typing any password. Needless to say, this blindingly easy Mac exploit really scary stuff. This vulnerability is similar to one Apple patched last month, which affected encrypted volumes using APFS wherein the password hint section was showing the actual password of the user in the plain text. Open System Preferences on the machine. Click the lock icon to make changes. Enter “root” in the username field of a login window. Move the cursor into the Password field and hit enter button there few times, leaving it blank. With that (after a few tries in some cases) macOS High Sierra logs the unauthorized user in with root privileges, allowing the user to access your Mac as a “superuser” with permission to read and write to system files, including those in other macOS accounts as well. This flaw can be exploited in several ways, depending on the setup of the targeted Mac. With full-disk encryption disabled, a rogue user can turn on a Mac that’s entirely powered down and log in as root by doing the same trick. At Mac’s login screen, an untrusted user can also use the root trick to gain access to a Mac that has FileVault turned on to make unauthorized changes to the Mac System Preferences, like disabling FileVault. All the untrusted user needs to do is click “Other” at the login screen, and then enter “root” again with no password. However, it is impossible to exploit this vulnerability when a Mac machine is turned on, and the screen is protected with a password. Ergin publicly contacted Apple Support to ask about the issue he discovered. Apple is reportedly working on a fix. Fortunately, the developer suggested a temporary fix for this issue which is as easy as its exploit. This password will prevent the account from being accessed with a blank password.